Religious reformer Jan Hus (c. 1370-1415) was born in Bohemia (Czech Republic) and studied in Prague. He was ordained as a priest in 1402 and became preacher at the Bethlehem Chapel. Hus admitted that he initially took up the priesthood to achieve a certain standard of living and reputation; however, he began to denounce the church’s practices of ‘fleecing the faithful’ (Fudge, 2010). Hus closely followed, and was influenced by, the polemical writings of John Wycliffe. He refused to submit to papal authority. In 1412, he exiled himself, during which time he wrote 15 books and continued to oppose Church and Pope. In 1415, at the Council of Constance in Germany, Hus was charged with heresy, and on 6th July, was stripped naked and his hair cut. After which, his soul was condemned to Hell and he was burned at the stake. 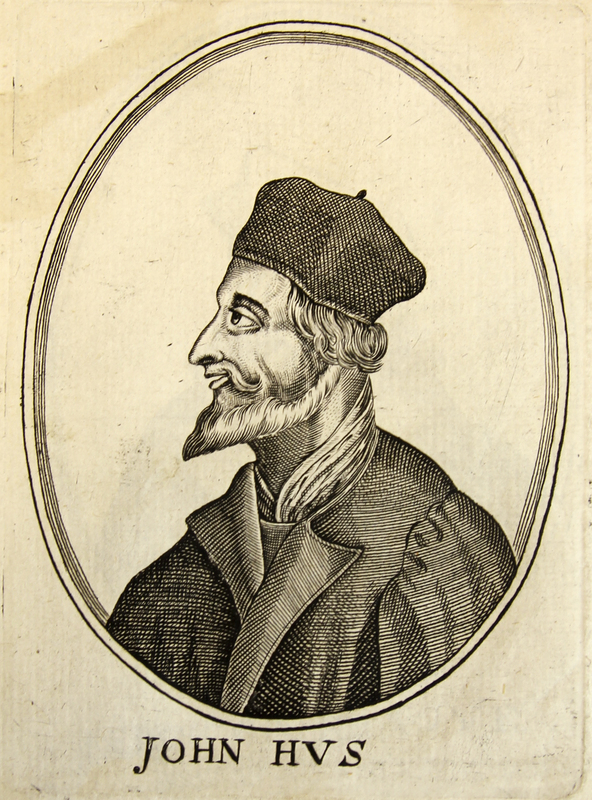 [James Stewart], “‘Jan Hus’ from [Herōologia Anglica],” ourheritage.ac.nz | OUR Heritage, accessed April 20, 2019, http://ourheritage.ac.nz/items/show/10334.